Japanese Prime Minister Shinzo Abe has arrived in Thailand today as he is scheduled to be on the first official visit as a guest of the government after the latest visit by then Prime Minister Junichiro Koizumi in 2003. 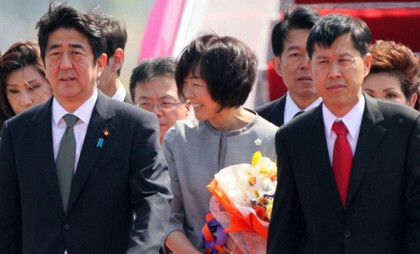 Mr Abe, accompanied by his wife Akie Abe and his entourage, arrived at Don Muang (ดอนเมือง) International Airport at 11.30 am. The Japanese delegation was welcomed by a group of high-ranking officials led by Deputy Prime Minister and Education Minister Phongthep Thepkanjana (พงศ์เทพ เทพกาญจนา). The Japanese prime minister then visited the Thai-Nichi Institute of Technology at 2 pm before travelling to Siriraj (ศิริราช) Hospital for a royal audience with His Majesty the King at 5 pm, together with Thai Prime Minister Yingluck Shinawatra. The two leaders reviewed an army of honour guard and held a discussion at the Government House to enhance cooperation between the two nations. A joint press conference will be held at 7.30 pm. followed by a dinner reception hosted by Ms. Yingluck on behalf of the Thai government for the Japanese leader. Mr Abe will depart for Indonesia to continue his Southeast Asian tour tomorrow at 7.45 am.